Fibrex is a composite frame material for replacement windows current manufactured exclusively by just one window maker, Andersen Windows and Doors which has been in the business for over a century. The material provides an excellent alternative to fiberglass and is marketed to upscale home consumers with a price point considered the highest in the windows replacement industry. Not only do they look beautiful but exhibit the best environment-friendly properties that has made Andersen Corporation the first and only Green Seal Certified window manufacturer. It was in 1993 when Andersen completed developing the innovative and highly sustainable Fibrex material from its now wholly-owned affiliate, Aspen Research Corporation. It now comprises the core technology that is leveraged across Andersen product portfolio. With tens of millions of dollars in corporate R&D funding behind it, Fibrex is a patented proprietary mix of reclaimed wood fiber (saw dust) from Andersen’s own manufacturing waste and a special thermoplastic polymer (vinyl), some of which is also reclaimed. Because of this, Fibrex windows combine the strength and durability of wood with the structural resilience and maintenance ease of vinyl. 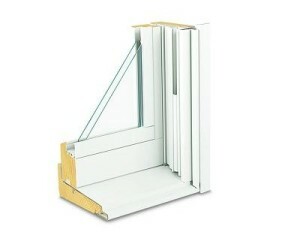 The Fibrex frame is manufactured with chambers and cells like the best vinyl frames for insulation purposes. Fibrex windows have been shown to be 3 times stronger than virgin vinyl but less than poltruded fiberglass. The greatest advantage lies in its superior thermal insulation properties that help reduce heating and cooling costs. It reduces VOC emissions since there are no wood preservative treatment or painting used. Using multiple air chambers in the frame construction process adds to its thermal abilities to make it’s the most energy efficient among any other replacement window framing materials. The one real disadvantage of Fibrex windows is its premium price, considered the highest among all window frame materials and the fact that there’s only Andersen that manufactures it, which makes distribution less than widespread. In addition, you can expect some window makers to foist knock-offs now that they know what it is made of. Just like fiberglass, Fibrex composite frames are maintenance-free. Unlike wood frames, Fibrex windows won’t leak, rot or absorb moisture like wood does and won’t sag like most vinyl over time. It also resists decay and fungal growth to ensure a longer lifetime and is warranted not to peel, pit, corrode, flake or blister. Fibrex windows comes in all the standard and special window types such as pictures, sliders, bays and bows, double or single hung, 3-lite configurations, and can include matching and removable decorative grills. But all these are available only from one store. Andersen has set-up “Renewal by Andersen” as a division of Andersen specializing in marketing a line of Fibrex windows while the main Anderson company concentrates on its main wood frame window portfolio. Every Fibrex window gets installed and warranted by factory trained and certified installers from the Renewal by Andersen affiliate stores. Unfortunately, not all cities have Renewal by Andersen stores and each store covers only a certain radius around it. While the main Anderson Company has over 3000 dealers nationwide as of 2006, the Fibrex line won’t be sold through them. Neither can the Fibrex line be purchased by independent contractors. Though this policy may be expected to change to cover wider distribution. See How Much You Can Save On Andersen Fibrex Windows Today! Prices of fibrex window products differ according to type, color, size, and features. Thus, it is necessary to compare the prices of various wood window brands and to put products side by side in order to see the pros and cons. Therefore, the price of the end product you will get is dependent on your careful selection and inspection.